This A frame chalkboard helps pubs, museums, retail stores, cafes, shopping centres, news agents, and more reach out to passersby to help turn them into customers. The write-on sandwich boards have 600 x 900mm textured blackboards on each side of the display, able to be written on with chalk sticks and liquid chalk markers in any colour. Use a damp rag to wipe away the writings cleanly and start over with a fresh surface. 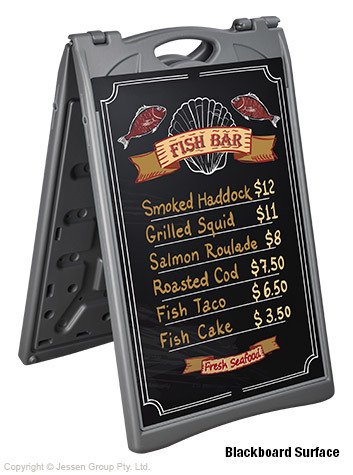 This A frame chalkboard, one of many sidewalk signs currently on offer, is a dual-sided display to maximise space by being able to be seen in multiple directions at once. Each of the included black boards is dual-sided as well, so you can have different advertising written on each side and then flip them over at the appropriate time to convey the right message to potential customers. The slide-in design of the holder makes switching them out fast and easy, and they rest securely within built-in channels. The pavement sign is made from roto-moulded silver plastic, offering a durable display at a low price. This signage display is portable as well, collapsing small for storage with a handle built into the frame for easy transport. A cord connects to the two sides to prevent the menu board from flopping over. This hollow display can be filled with sand or water to provide extra stability, helping keep the sandwich board upright during winds. Order today from Slimline Warehouse by 2pm EST to receive same day despatch with this and most other in stock products to anywhere in Australia!